Selecting the right Mac laptop isn’t easy, with three core models and four versions of the MacBook Pro - Apple’s most powerful and versatile laptop - to choose from. How you select the best Mac to buy depends on several factors, including what you need it for and of course, budget. Mac laptops go from $1299 to $2399. Apple essentially now has six laptops to choose from: MacBook, MacBook Air, MacBook Pro (13 and 15 inch screen), and the same 13 and 15 inch MacBook Pro, equipped with a Touch Bar and Touch ID. If you’re considering buying a new Mac because yours is starting to slow down, there is a cheaper option. CleanMyMac X is a powerful and effective Mac declutter and cleaning tool - clearing away 62GB - on average, of junk that slows Macs down. You can download it here for free. First introduced in 2015 and refreshed in 2017, this is the sturdy and reliable MacBook, Apple’s core Mac laptop. Not the cheapest (starting at $1299), but oddly enough, the lightest in the range - even lighter than the MacBook Air. 1.4GHz dual-core Intel Core i7. You can either select an 8GB or 16GB memory, with the option of a 256GB or 512GB SSD hard drive, giving you a decent amount of memory and processing power for work, studying and leisure. One downside with the MacBook is it only comes with one USB-C port for the power charging and data transfer (a new version of a USB that isn’t widespread yet; which will probably mean buying an expensive adapter). It is fast and efficient, with around 10 hours battery life. Not the most powerful Mac laptop in the range, but a sturdy workhorse for the price. Slim and lightweight, the MacBook Air is ideal for commuters, students and those who need a laptop occasionally, but won’t need to use it all of the time. For those on a budget, this is definitely the best Mac to buy, starting at $999, making it cheaper than the MacBook. It comes with a 13-inch screen, is only available in silver, and you can pick from two core models (1.8GHz, 128GB, or a 1.8GHz, 256GB); although both only come with 8GB of RAM. However, you can upgrade - at extra cost - to a 2.2GHz processor with 512GB worth of storage. A few downsides include the fact that it still uses a 2015 model processor, and it isn’t powerful enough for gamers, video editors, vloggers and professional developers. It’s also lacking a future-proof feature, as it doesn't come with a USB-C port. An 11-inch version is now only available second hand, with the newer 13-inch version coming equipped with more connectivity ports than a MacBook and the original smaller Air, including a MagSafe 2, two USB 3.0 ports, Thunderbolt 2, and an SDXC card slot. Ideal for those who don't want to carry a heavy laptop, although with it squeezing a similar amount of computing power in a smaller frame, it does weigh somewhat heavier than the more expensive MacBook. Something for students and those on a budget to keep in mind. For working professionals, video producers, designers, developers, and anyone who prefers to use a Mac laptop, the MacBook Pro is the workhorse many know, trust, and would recommend. Equally, gamers also benefit from the speed and processing power contained within the MacBook Pro. MacBook Pro - 15.4-inch - 2.2GHz, 2.5GHz, or 2.8GHz quad-core Intel Core i7 processor. Memory size options go from a 128GB to 1TB SSD hard drive in the smaller model, with 256GB to 1TB worth of memory in the 15-inch version. Both are available in space grey and silver. Newer versions of both come with a Touch Bar and Touch ID; although Apple have made significant upgrades in other ways too, which has made some journalists question “whether the 13inch MacBook Pros deserve the 'Pro' name at all.” It is also worth noting that the older, 15-inch version runs on the same processor model as the MacBook and MacBook Air, which means the same physical connectivity options are included: a MagSafe 2, two USB 3.0 ports, Thunderbolt 2, and an SDXC card slot. As we mentioned above, these new models are worth their own section in this Mac Buyers guide. In many ways, they're more powerful than the older models that lack the Touch Bar and Touch ID. Apple is taking biometric security seriously, with the Touch ID fingerprint sensor replacing the power button. Both of these features are powered by the Apple T1 chip, combining Apple's Secure Enclave architecture to authenticate biometric data (you’ll also find these on modern iOS devices) and the super-efficient processor from the Series 2 Apple Watch. MacBook Pro - 15.4-inch - 2.8GHz, 2.9GHz, or 3.1GHz quad-core Intel Core i7 processor. Memory size options go from a 256GB to a 1TB SSD hard drive, with an impressive 2TB an option in the 15-inch version. 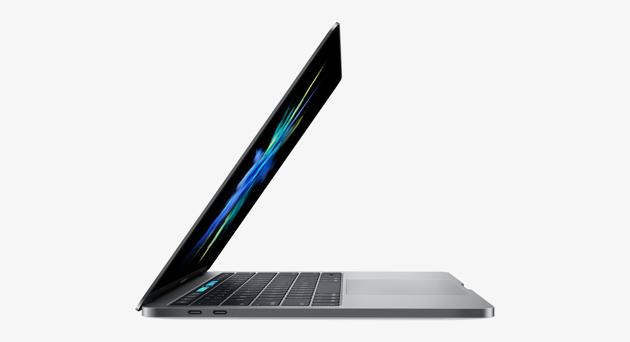 Touch Bar models come with four USB-C ports, with one needed for the power cord, and both come with a headphone jack, although they don't have any other physical connectivity options. Even knowing all of the specs, memory options, information on processors, systems and connectivity ports, making a comparison is still not easy. So below, we've considered which is the best Apple laptop from a range of viewpoints, considering how they might be used and who is using them. When it comes to carrying a laptop around, something that will fit into a backpack, shoulder bag, or even mid-to-large handbag, the MacBook is the lightest and most portable. Most would assume - as the name suggests - the MacBook Air, but the 2015 redesign made it heavier and comes with a lower resolution screen. Unfortunately, you do make some sacrifices for portability, with only one USB-C and, as the cheapest in the range, it is less powerful than other Mac laptops. But for those who want something easy to carry around, light, portable, and cheap, the MacBook beats the others. Students need laptops in classes, lectures and libraries - even when researching online, libraries - many equipped for modern laptops and tablets - are ideal places to work. Students need something portable and cheap - although many can stretch a budget a little further with the Apple education discount - making the MacBook an ideal option. Although for a little more computing power and something that takes up slightly less space in a bag, the Air is always worth looking at for students. Unless you are taking a computing, games or video course; in which case, neither the Air nor MacBook is an ideal option. 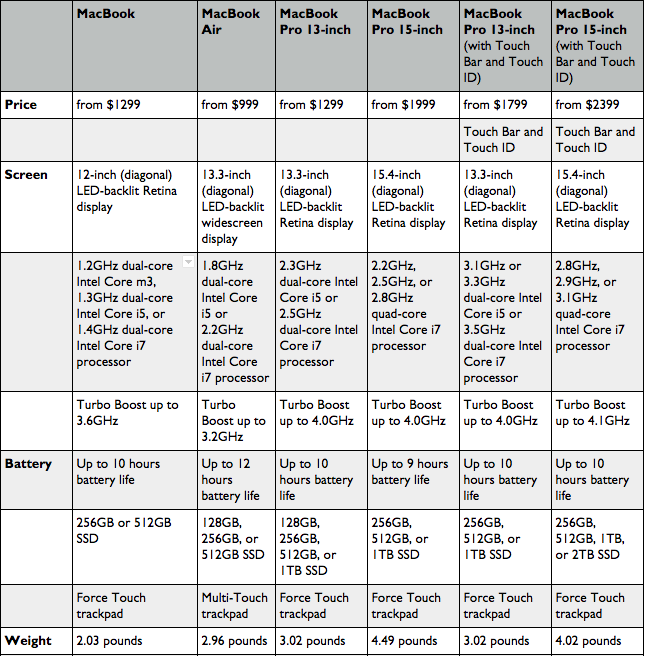 When price is the deciding factor, you can’t beat the MacBook Air. For those that need a fairly powerful, fairly light device, the 128GB 13-inch Air starts at $999 - compared to $1299 for the next cheapest option, the 256GB 12-inch MacBook. Upgrades to the memory or processor cost more, so if you’re on a budget, think carefully before wanting to customise. Although there isn’t a huge amount of difference when it comes to battery life, most Mac laptops come equipped with a minimum of 10 hours of Wi-Fi web browsing and/or iTunes video streaming. Beating the others is the “all day battery” that is included in the 13-inch MacBook Air, with 12 hours available before you need to use a charger. However, as any Mac users knows, the older a laptop gets, the weaker it charges and quicker a charge disappears, so it is always useful to have a power cord handy when you are planning to use a Mac laptop for a prolonged period of time. Storage is a moveable feast, and something Apple is consistently generous with. Not only can you upgrade all the way to 2TB - with the 15-inch MacBook Pro (with Touch Bar/ID) - but you can use cloud-storage and external hard drives. But when it comes to physical storage you can access directly within a laptop, the 2TB Touch Bar/ID 15-inch Pro beats the others. Although the good news with Mac laptops is every one of them now comes with SSD memory, which is far more efficient than the memory in older models. It is also less likely to break, since these do not include moving mechanical parts. Again, the 15-inch MacBook Pro (with Touch Bar/ID) is the fastest and most powerful. The most expensive customised model will come equipped with a 3.1GHz i7 quad-core processor, which when coupled with 16GB of RAM means it will power through almost any task you can throw at it. Since the processor is a quad-core, it is significantly more powerful than the others, many of which use dual or m3 processors. Not that the others aren't powerful; they just aren't as powerful as the top-of-the range Pro. Which is best for work? This largely depends on the type of work you do. For intensive tasks, then you should opt for the most powerful version you can afford. Combined with generous screen real estate, and that could mean the 15-inch MacBook Pro (with Touch Bar/ID). But not everyone needs that much screen, or that much processing power and RAM. Others simply connect a laptop to a larger screen, giving them useful portability. If that is the case and you don't need a Mac laptop that could open a hole in the space time continuum, then you could opt for something less powerful and more versatile, such as the MacBook Air. More cost effective too. We’ve left this option out of the table below, since it largely comes down to personal preference, the type of work involved, whether a device needs to be portable - or not - and budget. For more intense and involved games, that need the most amount of computing power possible, the 15-inch MacBook Pro (with Touch Bar/ID) is the best option. Although more expensive, it comes equipped with an AMD Radeon Pro 560 graphics card with 4GB VRAM, making it more powerful than some Mac desktops and so-called “dedicated” gaming computers. If you don't play games that are too intense, or have a lower budget, then the Intel HD Graphics 640 card in the 13-inch MacBook Air is the next best option. take care of your Mac's health with health alerts, and more. 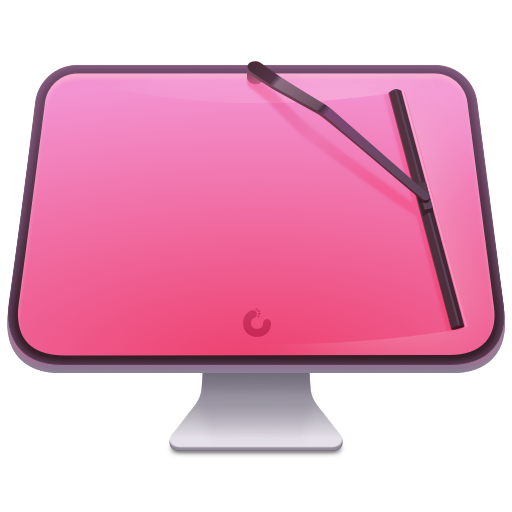 With CleanMyMac X, your Mac is always as good as new. You can download it for free and give it try!